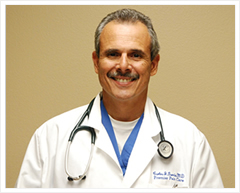 Dr. Carlos J. Garcia received his undergraduate degree with honors at the University of Puerto Rico in 1978. He completed his M.D. at the Medical College of Wisconsin-Marquette University in 1982. His Anesthesiology training was completed at the University of Illinois Hospital in 1985. Dr. Garcia received the prestigious Bruce M. Cherkala award in Clinical Research in Anesthesiology. He served as a Major in the United States Air Force, from 1985-1988. During this time, he was Chief of Anesthesia and Pain Management. He joined a private practice in 1988 and moved to the Denton area in 1990, practicing Pain Management and Anesthesiology. In 2002, Dr. Garcia started the only full-time interventional pain medicine practice in the area, Premier Pain Care. He has trained and is certified in state-of-the-art procedures such as: Regenerative Injection Therapy using Platelet Rich Plasma/ BMAC, Prolotherapy, Vertebroplasty, IDET, Disc Decompression, Spinal Cord and Peripheral Nerve Stimulation. Dr. Garcia belongs to numerous medical organizations such as the International Spinal Injection Society, American Society of Interventional Pain Physicians, Texas Pain Society, and the Texas Medical Association. He is actively involved in numerous local and national organizations. He enjoys gliding, competitive shooting sports, and most importantly spending time with his family. Disclaimer: The information presented in this web site should not be considered medical advice and is not intended to replace consultation with a qualified medical professional.